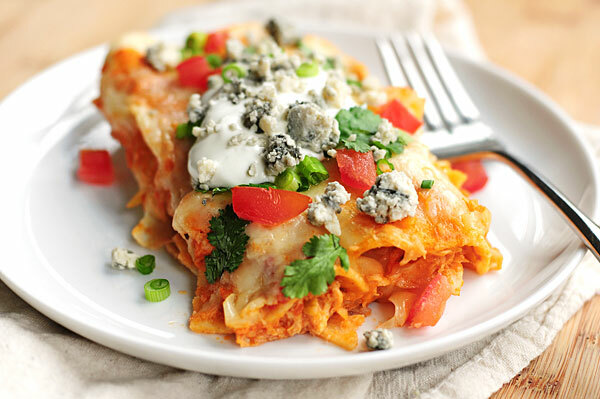 Mexico meets Buffalo in this Buffalo Chicken Enchiladas Recipe. My family is pretty crazy about anything with hot sauce. Seriously, these days we go through sriracha almost as quickly as ketchup. Give them Buffalo spiced anything? Happy family! Or spicy Mexican fare? Muy bien! So why not combine the two? Duh. Seems a little more than obvious now. It’s not an original idea. 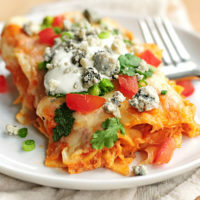 Apparently I’ve been missing out on the genius of Buffalo Chicken Enchiladas for a while. My friend Jessica, from How Sweet It Is, was a bit quicker at figuring out the brilliant combo. She’s crazy smart like that. I guess it’s better late than never, huh? 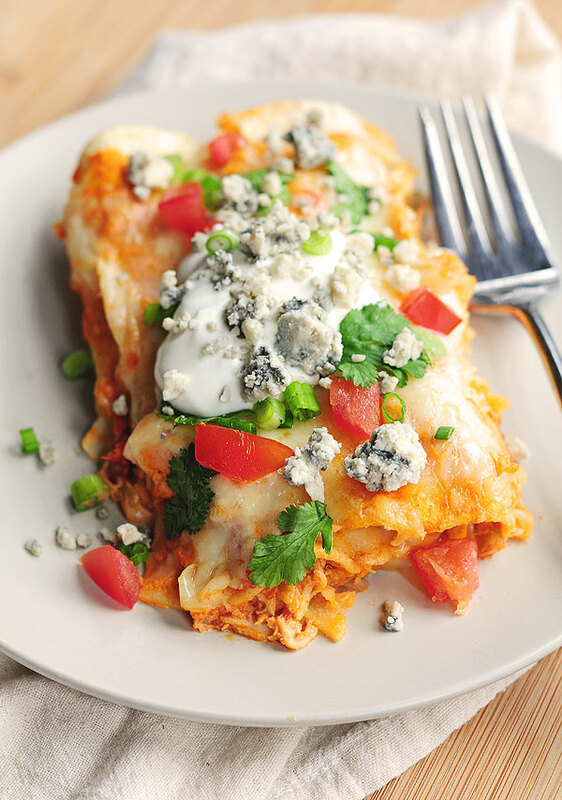 These Buffalo Chicken Enchiladas were easy enough for a weeknight meal, and had the kids instantly drooling when they were greeted by the aroma. 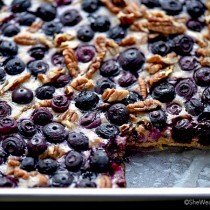 The pieces and parts can be prepped ahead, or the whole dish put together, refrigerated and baked when ready to serve. The ingredients are basic, which is always nice. While I used corn tortillas (which I think is traditional for enchiladas), if you prefer flour tortillas, go for it. We tend to like the flavor and texture that corn tortillas add. They can be more challenging to roll, but with a little warming in the microwave of warm oven, you’ll find them easier to work with. I used the Buffalo Hot Sauce from a batch I made in these enchiladas, but easily substitute your favorite hot wing sauce. I hope you enjoy this combination as much as we did. 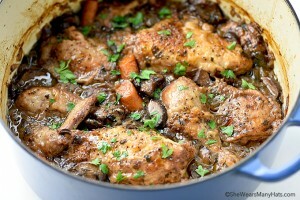 It makes a great meal served with a simple side salad, and would be the perfect recipe to double (or triple) for serving a large hungry crowd. 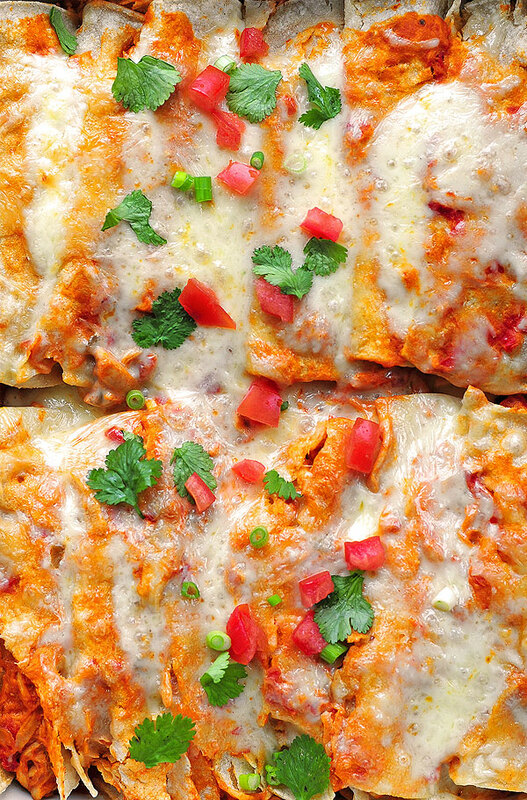 Mexico meets Buffalo in these family-friendly spiced up enchiladas. Heat oil in large skillet over medium heat. Add drained diced tomatoes, tomato sauce, and green chiles; bring to a simmer and cook for 3 minutes. Mash any larger pieces of tomato that remain. Coat the bottom of a 9x13-inch oven-safe baking dish with about 1/3 cup of the tomato/green chile sauce—just enough to lightly coat bottom. Stir hot sauce and cream cheese into tomato/green chili mixture until cream cheese is incorporated. Reserve 1/3 cup of sauce. Add chicken, stir to combine. Keep warm over low heat. Warm corn tortillas in microwave for up to 30-45 seconds to soften up (or in warm oven on baking sheet for a couple of minutes, being careful not to burn). Top with reserved 1/3 cup sauce (plus remaining chicken mixture, if any) and shredded cheese. Bake in 350-degrees F oven for about 15-20 minutes until cheese is melted. Serve warm. 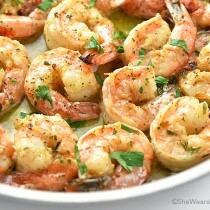 If desired, garnish with sour cream, chopped cilantro, diced tomatoes, chopped green onions, or crumbled blue cheese. Love enchiladas, this buffalo one looks very delicious!!!! Your family sounds a lot like mine. We love Mexican and we love hot sauce. Buffalo anything is always, always welcome around here. Love these! 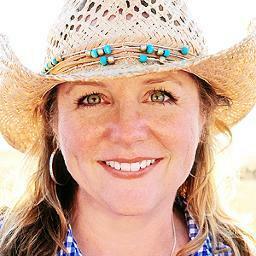 Love these enchiladas Amy! Bring on the Mexican dishes! Sounds like our family, all things Mexican and hot sauce get devoured! Love these! Oh my gosh, yes! They were quite addicting. I made this tonight and it was a hit! The only thing I did differently is I added Spanish rice to the filling. I will be making again. 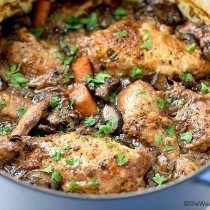 Thank you again for another amazing recipe. Adore the blue cheese in this. Great dish for a crowd. Amy, my first set of company loved these so much, I am making them again for “new company” one week later! I added black olives on top 🙂 Thanks for this one!! Yes yes yes. Everything about this screams yesss. And it will be in my tummy very soon. where ‘s the buffalo sauce? this looks like normal enchiladas?? 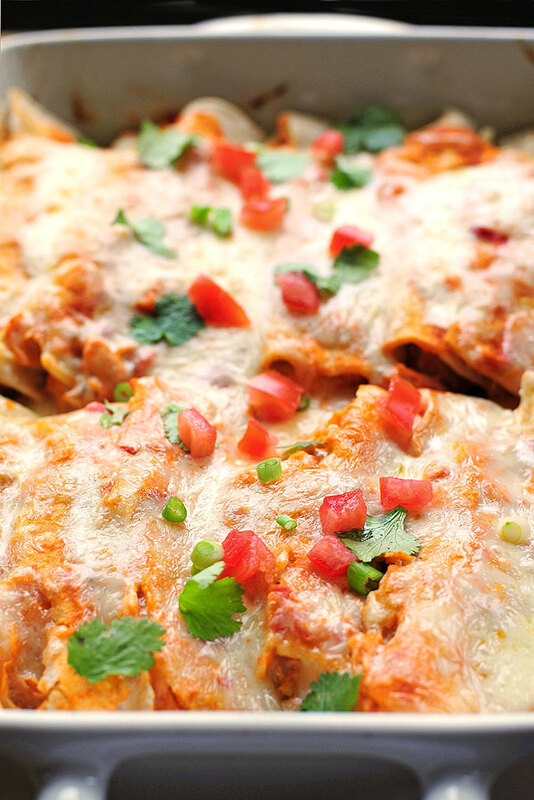 I love enchiladas and these look amazing! 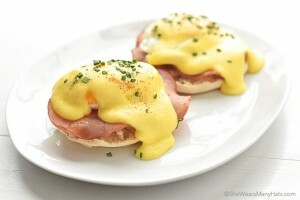 I can practically taste this. Yum. Made last night and it was wonderful! Added some onions, chorizo sausage and black beans….. wonderful! 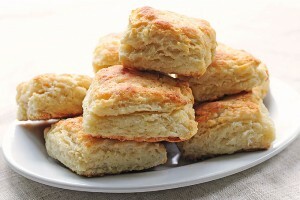 I made these last night on a whim and OMG they were amazing! My husband licked his plate! We too do not like enchilada sauce so I took the advice of another comment and used Herdez Ranchero salsa and extra buffalo sauce! it was sooo good! thank you!